New file attached to this post. .xls file available on PM request, it's too big for the site despite being only the exact same info. Currently a work in progress that's about 85% complete, here's the latest result of my effort to catalog everything that ever had the Battletech IP stamped on it. Waste of time, yeah, but that's what hobbies are for. Instead of one big text list, I've been working to input everything into a spreadsheet format, which allows me to add a whole ton more information. This is Open Office spreadsheet, which I think opens fine in Excel, but I'm not sure. I can convert it to .xls format, but then it goes from 96k to 459k, well above the file size limit our board can handle. Miniatures. All of them. So you all can stop bugging me for my inventory sheets now! Sections incomplete include a complete listing of all MWDA game pieces and an index of foreign language products. I'm always looking for input, so if you know of anything you don't see on the list please give a holler. I can't promise there isn't an error or two here and there, but I've striven for accuracy in everything. There's a lot more to talk about, but I know people don't like reading the walls of text, so I'll just answer questions if there are any. Enjoy! .xls format for Excel users can be found at the link below, thanks to Doug Glendower! Merry Christmas! Latest update includes all product released this year (or should, at least), and I've completed the MWDA section. Battlecorp fiction list still needs to be updated, and I still haven't worked on the foreign language product, though a couple people have sent me some excellent lists. As usual, all input is welcome! 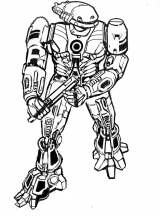 Re: The Full Battletech product inventory returns! Yes, I do have too much time on my hands. I needed something to fill it! Well that's just crazy awesome useful. Thanks Jal! Is it possible to put it up in another file format? I'm having trouble getting the .ods to work well. "My name is Saul Tigh. I'm an officer in the Colonial Fleet. Whatever else I am, whatever else it means, that's the man I want to be. And if I die today, that's the man I'll be." Where's the Comstar House book (1628) at?! Yes please, an Excel of this would be very helpful! 555th Prawn Grenadiers, Tempura Galaxy, Scampi Cluster, Gumbo Super Nova, Risotto Trinary, Creole Star. Awesome list you put together. Helps with checking what I am missing in my humble collection. When converted to .xls, it comes out to almost 500K, too much for our board to handle. PM me an email and I'll send it to you. Can you save it as a CSV file? That's a lot smaller and compatible with most spreadsheet programs. You'll lose any fancy formatting, but if you just want to get information out there it's a decent option. Now do I want to print this up, and start highlighting what I have. Then get mad becuase I don't have some of the special ones!!! Impressive work; I see you expanded the scope and improved the sorting since the last forum crash. Good to have this back! Need any help with the German products? - The ISBN10 of More Tales of the Black Widow is 1555601073. Says Sarna.net, and I know this to be correct because I put it there. Plus, Amazon also says it's correct. - There's at least one "corrected printing" of TRO3057 (the 3rd printing) with altered (cut) content. They removed the notion that a Tramp-class variant with 4 collars and a LFB was observed with the Clans. I have both editions of the book on my shelf. When asked, Herb ruled that the report remained canonical although not neccessarily correct, because it was simply omitted and not rescinded. Thanks for the Black Widow ISBN. For some reason, my copy has no ISBN, neither on the back cover nor on the copyright page. The TRO is a second or more printing, and I'm trying to work out the best way to mark those. right now I just note that there were corrected printings in the notes column. I'd love help with the German stuff. I had a link from either you or Jymset saved in my PM box, but that was on the old forum. If you've got something, please PM me with it or post here! I take it the PM in question was too new to be included in the forum archive (you can still log in and access your PMs on the archived forum, at least up until the backup took place)? Anyways, yes - I'll help if I can. I am essentially doing the same work for the Sarna.net BTW, trying to hunt down every last BT product. I may have to rely on your list and knowledge in a number of instances. I can give you the entire German FanPro catalogue (I think) and I can also point out a number of instances where FanPro didn't merely translate, but expanded the material (like additional scenarios in Tales of the Black Widow, additional rules, stables and 'Mechs in the German Solaris VII box, etc.) though that list won't be complete as I don't actually own some German products. Perhaps Jymset can help out and fill the gaps, or work down the list from the other end. My suggested modus operandi would be to email you an excel (or open office, if you prefer) file with the data and you can then copy & paste it into your master file. May I suggest that you create a separate subdirectory for "translated" items and "original foreign language products" - I have seen Italian and Spanish novels and game products on ebay so they do exist, I just don't know if they adhered 100% to the FASA originals or added original stuff like FanPro did. May be worth to hunt down Spanish and Italian users on this forum and see if they're interested in joining the project. Rock you like a DV-6M! I really am bad at letting go. Jal, you want me to host the .XLS of this on Cavalier Cavalry? I'll do it in a heartbeat. If so, send me a PM, and I'll get you an email to send it to. That's really an awesome lot of works !! Thanks a lot !! The Box set, also translated by Hexagonal, got the number "00500", and the ISBN "0-931787-64-5 FASA2000"
I don't have Mechwarrior/Technoguerrier with me at the moment, but I can find the relevant informations if need be. There was no other battletech products ever translated into French. 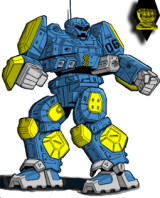 "The Mechwarrior formerly known as Stenka"
And the .xls file is up on Cavalier Cavalry, with Jal's permission in the PDF library section. Thanks, Doug! 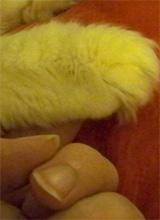 I've added the link to the first post for ease of access. What's the story on that avatar? 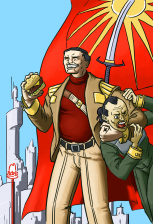 Is that Hanse Davion headlocking someone while eating a burger? Is that supposed to be Mad Max or Michael Hasek Davion? 2 of the greatest lines in BT history are delivered by these two characters mere pages apart: "I give you the Cappellan Confederation!" then "the plate! Grab the plates!!!" Would you also be interested in German language magazines (fanzines, MechForce Germany and Fanpro's House mag)? I've drawn up an article on FanPro's "house magazine", Wunderwelten, but am missing issues 6, 27, 29, 37 and 48. I have a smattering of MFG and German Fan publications, but this kind of source material is difficult to come by and my "collection" has more holes in it that substance. It's curious how I managed to scrounge up more English fringe material than German fringe material... so what you mention seem to be material that we're still missing over at BTW. I have a large list of German magazines sent to me by Jymset some time ago. I've been debating whether to out them into the Magazines sheet or the Foreign Language sheet. Not sure from memory if I have WW #6, but the others should be in my collection. However, you will have to wait for the second weekend in September, currently I'm 600 klicks away from home. Save for the fact they lack licenses to be officially 'in' the BTU.